How Do Airlines Set Prices? There's a lot more to flight pricing than meets the eye. In this article, we take a look at fare buckets, fare rules, codeshares, consolidated fares, best days of the week, and everything you need to know to find the absolute cheapest flights. Read on for the ultimate inside scoop written by experts. Looking for flights can be great fun, especially when you land a good deal. But sometimes it’s rather frustrating. You spend hours on the internet, trying different websites, but reasonable fares are nowhere to be found. Instead, you see prices which are double what you’ve paid before, or you remember a friend just bought that flight for hundreds less. The price of your ticket consists of a number of things. The last four are sometimes optional (especially for low-cost airlines) where you pay for them on top of the ticket price if you want them included. With the older, more traditional airlines, and for long-haul flights, these things are usually included in the ticket price. Airlines first determine the type of plane they will use for a flight, and this tells them how many seats are in each travel class. While a travel class indicates the quality of class (First, Business, Premium Economy or Economy), a booking class refers to the type of ticket. Each booking class (aka fare class or fare bucket) has different rules and restrictions. The cost of changing or refunding a ticket can vary widely, some can only be booked if your flight is more than 14 days away or only on weekdays, and sometimes you earn more frequent flyer miles (or none at all). Each booking class has a different price based on these factors. And although there may be 100 seats in Economy, there may only be 10 seats in each different fare bucket. Online sites like Expedia.com and Kayak.com, will show you the cheapest booking class available that matches all of your criteria. The reason for all these booking classes, is that airlines try to maximize their profit. They know that there are mainly two types of travelers: leisure travelers and business travelers. They both need flights but their buying behavior is quite different. While the leisure traveler is (generally) more flexible with dates, business travelers have to travel on a certain day and often at a certain time. Leisure travelers tend to book well in advance giving them time to plan their trip, therefore they buy up the cheaper booking classes. Business travelers have to leave quite spontaneously sometimes and are willing to pay more for a ticket in order to make it to their meeting. As we get closer to the departure date, there are only seats in the higher, more expensive booking classes available. 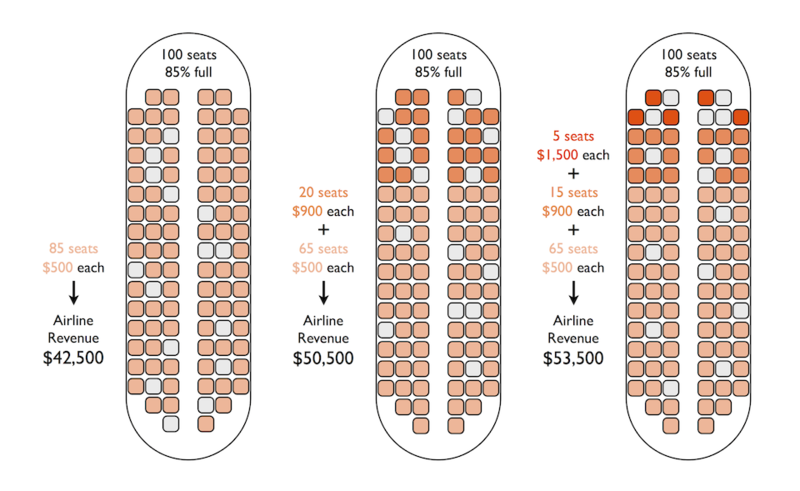 While you might expect the airlines to lower their prices a few days before the departure day to occupy the last seats, the opposite is true: Selling 20% of the remaining seats for $1,500 is more profitable than selling half of them for the regular fare of $550. Where you might see prices fall close to the departure date (or even well ahead of this), is where the cheaper buckets haven't been fully sold out yet, and the airline opens up a new discounted booking class, trying to at least cover their costs for the flight. Prices change due to seat availability and demand. The cheaper booking classes might be sold out even if there's still 3 months before you leave. There are some dates of the year where there is simply higher demand. When a lot of people have to fly somewhere (and even more when they want to go to the same destination or area), airlines will set their prices at a higher level. Christmas, Thanksgiving and school vacations are the busiest times. Sometimes though, the reason for expensive flights doesn’t seem obvious at first. Imagine you want to spend your vacation in the Philippines and your desired travel dates coincide with a public holiday there. Many Filipinos living in the US wish to see their families and prices will rise because of higher demand. Are there cheaper days to fly and book? Yes, indeed. Even during the same week, prices can vary widely. Generally, leaving on a Monday, Friday or Sunday will increase the risk of paying more for your ticket as business travelers leave or return from their trip, and families leave or return from their weekend trip. Finding a cheap ticket is more likely on a Tuesday, Wednesday or Saturday. In addition, if you're okay with less convenient departure and/or arrival times, the better your chances of paying less, since most people prefer to leave at 9am, instead of 5am, or return before 8pm, not 11pm. Many of the cheaper booking classes have a 14-day advance purchase restriction, meaning that you can only buy them 14 days or more before you depart. Other cheaper fare classes also have a Saturday night rule, where you have to stay the Saturday night in your destination for the lower fare. These usually rule out the business traveler as they want to get home for the weekend or they fly last-minute. Are there cheaper areas in the world? Airline competition is also an important factor contributing to your ticket price. If there is a lot of competition (i.e. a lot of airlines flying there), prices will be significantly cheaper. This doesn’t only apply to certain regions but also certain routes between two cities (i.e. Los Angeles – New York, New York - London). If there's a lot of airline competition, this also means there's a lot of passenger competition, meaning more people want to fly to a particular destination. Therefore, you're competing for those cheaper booking classes. As a general rule of thumb, the earlier you book, the better. Codeshare means that two (or more) different airlines share and offer the same flight but only one of them is actually flying the plane. Airlines use codeshares to extend their network and fill a whole plane (instead of having 2 flights, half-full). There are a lot of advantages for the passenger, such as booking a flight from A to B to C through one airline’s website, even if this airline is not flying the entire route. Let's take a detailed look into the pricing of a route from New York (JFK) to London (LHR) one-way on March 19, 2014. Currently, prices range from US$391 all the way up to US$7,574. There are a lot of airlines flying this route. There are 19 different direct flights alone that day, operated by American Airlines, Delta, British Airways and Virgin Atlantic. The rest of the flights are codeshares. So even though KLM, Air France, Finnair, Iberia and Qatar Airways are all selling direct tickets, they are not actually flying the route. All the other airlines will fly to their hub first and then continue on to JFK (e.g. Turkish Airlines will go via Istanbul, Aer Lingus via Dublin, Lufthansa via Munich or Frankfurt, etc). For simplicity, let's focus on the earliest direct flight from New York (JFK) to London (LHR). This 8.30am flight is operated by Virgin Atlantic. If you visit their website or search Kayak, you'll find a one-way price on March 19 for US$1,346. The cheapest booking class available is 'B' and the rules state that you can only book this ticket if you depart on a Monday, Tuesday, Wednesday or Thursday. Now, here's the beauty of codeshares. The flights are operated by Virgin, but they can also be purchased via Delta. Kayak doesn't show us this 8.30am flight under Delta, but if you go directly to Delta's site, you'll find it for US$1,043 (a 23% discount). Delta has it under a different booking code 'H' which doesn't have the day of the week rule like Virgin, but does charge a US$350 fee if you need to cancel. Our New York (JFK) to London (LHR) example gets even better with consolidated fares. Travel agents and sites who book a lot of people on a route can negotiate directly with an airline to give them a cheaper price for recommending the airline to their customers. This is what's called a consolidated fare. As this route is really competitive, the cheapest consolidated fare is US$437 (that's less than one third of our original finding). Some sites hide the name of the airline or give you a rough estimate of depart and arrival times. Usually they'll show there's a flight on a 'Major Airline' that departs between 8 and 9am and lands between 7 and 8pm. This one was easy enough to figure out though as there's only 1 direct flight within those times. Understanding these basics will increase your chances of paying less for your flights in the future. If you still have problems, or you just don't want to bother with all of this, then just let us do it for you on Flightfox by launching a contest, and we'll do our best to find you a great deal. Chris is a Flightfox expert. He's 24 and based in Hamburg, Germany. He studies translating and interpreting at the University of Leipzig. He enjoys travelling and just finished his first RTW trip through South East Asia for 9 months as well as New Zealand, the Cook Islands and the US. Many thanks to Lauren and Brentito86 for collaborating on this article.